Put simply, Room 8 was – is – one of the Echo Park’s most famous residents, and, between rock stars, art stars, writers and intellectuals, political luminaries, we have quite had our share. There are photographs of the self-possessed tabby on Echo Park Historical Society calendars and mounted on the wall of local restaurants; there’s the mural on the side of Elysian Heights Elementary; there are testimonials – dozens of them – carved into the cement on Baxter St. and Echo Park Ave. in front of the school where children wrote their names and a few personal words about the feline superstar. Some of scratched pictures of him into the cement. They say things like, “I love Room 8 because he sleeps on my desk.” His paw prints grace the sidewalk in front of Elysian Heights Elementary. Room 8 lived at Elysian Heights Elementary for over 15 years. He was about seven when he first showed up in 1952, skinny and determined to make a life for himself at school. John Fernandez & Room are serenaded by neighbor. He ate the children’s sandwiches and demanding to be allowed to stay in class. Nights, he would disappear, but he always showed up for class in the mornings, and he seemed to prefer classroom number 8, though he wasn’t entirely exclusive about it. The illustrated story of this famous feline was told in the book “A Cat Called Room 8,” which was published in 1966. The book was written by Virginia Finley and former school principal Beverly Mason. The book was illustrated by Valerie Martin, who taught at the school when Room 8 made his debut. In addition to a book, Room 8 was also featured in countless newspaper and magazine articles, including such periodicals as Time and Look magazines, and television programs. As for fan mail, he is said to have received more than 10,000 letters; the children of Elysian Heights Elementary School served as his secretary, answering the cat’s correspondence. 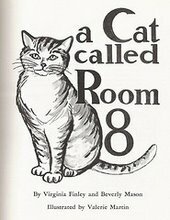 Room 8 turned into a cat who was famous for having been famous. But he was genuinely special, too. He loved the life of the classroom. And with children he was unflappable. Room 8 is buried at Calabasas pet cemetery.